I’ll admit that I was never really a Green Lantern fan when I was into comics. My peer group had a certain thing for Marvel Comics and the X-men franchise. I guess it was rather natural that we also had a certain disdain for the DC universe in general. The Green Lantern was one of those characters that we knew were powerful but just wasn’t cool for other reasons. I think it was the lack of a cape. The other flying characters always had capes to go with their tights, and somehow that made the getup not totally ridiculous. But GL didn’t roll like that and the lantern was an old anachronism even though we weren’t old enough to use that word. Fast forward to the present day. Superheros are cool again and the special effects can finally keep up with the audience’s expectations. Hal Jordan as portrayed by Ryan Reynolds seems OK, but not memorable. I think my lack of fanboy baggage might be giving him the benefit of the doubt. I remember the buzz leading up to the movie from last year’s Comic-Con and some of his interviews. I think he was genuinely into playing the role and not just the part. The problem may be that Ryan Reynolds couldn’t make Hal Jordan into a superhero. It takes the ring to make Hal into a superhero. The rest of the movie is almost a cookie cutter copy of any other superhero movie that you are likely to have seen these past few years. None of the dialogue is quotable. The other characters are flat and one dimensional. I don’t think this was a bad movie, but I’m having trouble finding reasons to recommend seeing this movie in the theaters at $10+ a pop. Bottom line, I’d say wait for it to show up on Netflix or your rental service of choice. 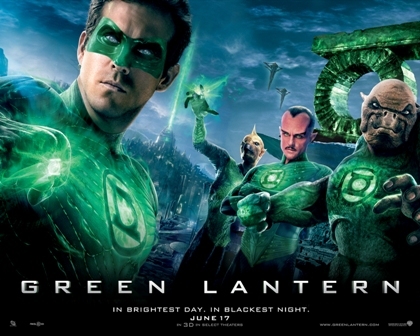 On a side note, I saw Green Lantern in 3D. Yeah, yeah don’t remind me. I chose to go to the 3D version because I missed the 2D showing I wanted to see, and the next showing would have been another hour and a half wait. This 3D treatment didn’t give me a headache, so there may be hope for the technology after all. The 3D effects were subdued and non-gratuitous, so I give that part of the movie a thumbs up. This entry was posted in Blog, Reviews and tagged Comics, DC Comics, Green Lantern, movies, Ryan Reynolds. Bookmark the permalink.